Multimodel inference refers to the task of making a generalization from several statistical models that correspond to different biological hypotheses and that vary in the degree of how well they fit the data at hand. Several approaches have been developed for such purpose, and these are widely used, mostly for intraspecific data, i.e., in a non-phylogenetic framework, to draw inference from models that consider different predictor variables in different combinations. 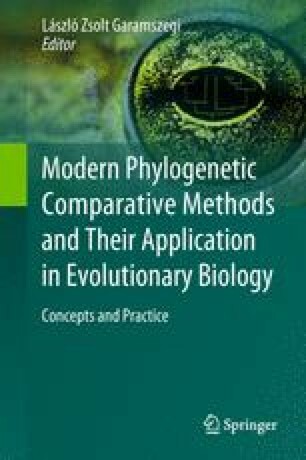 Adding the phylogenetic component, in theory, calls for a more extended exploitation of these techniques as several hypotheses about the phylogenetic history of species and about the mode of evolution should also be considered, all of which can be flexibly incorporated and combined with different statistical models. Here, we highlight some biological problems that inherently imply multimodel approaches and show how these problems can be tackled in the phylogenetic generalized least squares (PGLS) modeling framework based on information-theoretic approaches (e.g., by using Akaike’s information criterion, AIC) or maximum likelihood. We present a conceptual framework of model selection for phylogenetic comparative analyses, where the goal is to generalize across models that involve different combinations of predictors, phylogenetic hypotheses, parameters describing the mode of evolution, and error structures. Although this overview suggests that a model selection strategy may be useful in several situations, we note that the performance of the approach in the phylogenetic context awaits further evaluation in simulation studies.